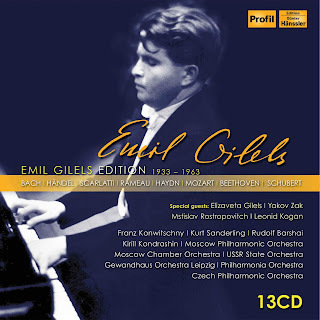 The latest keyboard artist to be anthologized on the Profil label is Russian pianist Emil Gilels. The Emil Gilels Edition, a box of thirteen CDs, was released this past April; and the recordings account for Gilels’ work between 1933 and 1963. Gilels began recording for major labels in the Fifties; and, when he died on October 14, 1985 he was in the process of recording the complete cycle of piano sonatas by Ludwig van Beethoven for Deutsche Grammophon. Considering the breadth of Gilels’ repertoire, it is a bit disappointing that the number of composers represented on the remaining twelve discs is relatively narrow. There is a generous amount of Johann Sebastian Bach, including transcriptions by Carl Tausig and Alexander Siloti, and two concerto performances. Tausig also shows up on a disc of Domenico Scarlatti with arrangements of two of the thirteen sonatas that Gilels’ plays on that CD. The repertoire then moves into the Classical period with generous attention to Mozart, Joseph Haydn, and Ludwig van Beethoven, including all of the latter’s piano concertos. The final disc is devoted to Franz Schubert, coupling the D. 850 sonata in D major with a rather ghastly piano-and-orchestra arrangement by Dmitry Kabalevsky of the D. 940 fantasia in F minor, originally written for four hands on one keyboard. 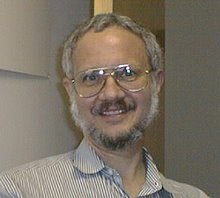 The performances themselves tend to be variable across the full scope of this collection. Things are at their best when Gilels is playing trios with violinist Leonid Kogan and cellist Mstislav Rostropovich. However, those selections can also be found in a five-CD box set released on the DOREMI label less than a year ago. Readers probably know that I found Profil to be a valuable resource when it came to historical recordings by Sviatoslav Richter; but I fear that, where Gilels is concerned, history is better served by other sources.